In the south the Trinovantes were also at odds with the Romans over the way in which Camulodunum (Colchester) had been commandeered as a retirement home for Roman veterans. The Trinovantes too displayed acts of defiance, though on a smaller scale. Boudicca gathered her forces together, both Iceni and Trinovante stood shoulder to shoulder. The march was believed to have started from the Iceni capital of Venta, (Caistor St. Edmund) which is a few miles south east of present day Norwich. 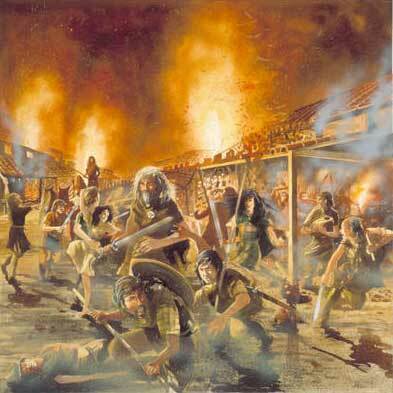 They began heading south, towards Camulodunum (Colchester), slaughtering anyone who stood in their way. Anybody or anything that was remotely connected with the Romans was killed or destroyed. Paulinus received the news of the uprising, and immediately despatched forces to intercept and quell the rebellion. This would take time, as the rebels were approaching Camulodunum, which was not heavily defended due to the number of troops that had been removed to fight in Wales. Meanwhile, without any evident cause, the statue of Victory at Camulodunum fell prostrate and turned its back to the enemy, as though it fled before them. Women excited to frenzy prophesied impending destruction; raving in a strange tongue, it was said, were heard in their Senate-house; their theatre resounded with wailings, and in the estuary of the Tamesa had been seen the appearance of an overthrown town; even the ocean had worn the aspect of blood, and, when the tide ebbed, there had been left the likenesses of human forms, marvels interpreted by the Britons, as hopeful, by the veterans, as alarming. Colchester had many fine buildings. Council chambers, theatre, and a temple of the Imperial Cult. This temple became a particular target for the Britons as it represented everything that they hated about the Romans. The Imperial Cult was set up for the purpose of encouraging influential tribe leaders to show loyalty to the Emperor and in return being allowed to enter the Roman governing class. In fact the exact opposite seems to have happened, with many members of the cult being involved in the rebellion. There were only a handful of regular troops in the area and they soon fell to the onslaught. Those that survived took refuge in the temple, where they held out for two days before being overwhelmed and killed.. 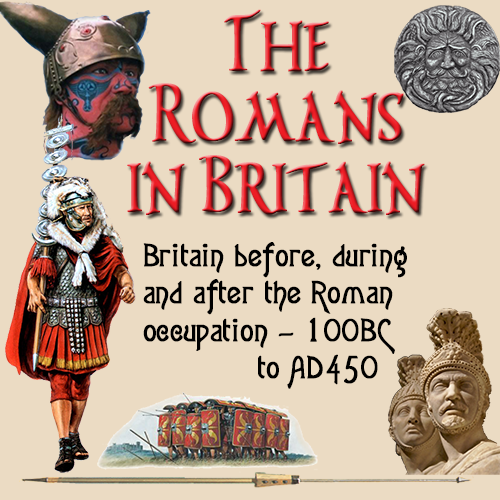 Seeing the massed tribal forces descending on Camulodunum, the Romans sent a messenger to Londinium (London) to request Procurator Decianus to send troops to aid the besieged Roman veterans. The IXth Legion Hispana, led by Petilius Cerialis, was sent to Camulodunum from their base some 80 miles north of the town. He wasted no time and immediately sent his troops in to deal with the rebels. A full legion of 5,000 men entered the town, but Boudicca had already received news of their arrival. The British warriors ambushed the legion just north of Camulodunum, wiping out the troops. Every infantryman was killed. Boudicca had no room for prisoners. The end result of the battle was the complete annihilation of the Roman legion. Only the cavalry survived in any numbers and Cerialis ordered them to retreat north, while the rebels marched onward to Londinium.